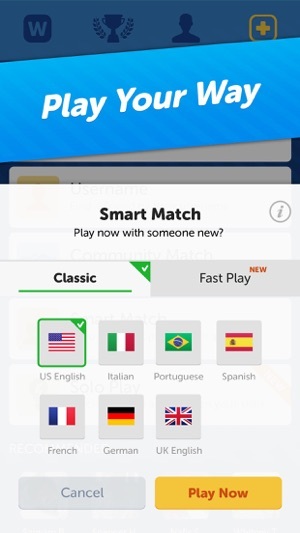 The World’s Most Popular Mobile Word Game now has even more ways to play! 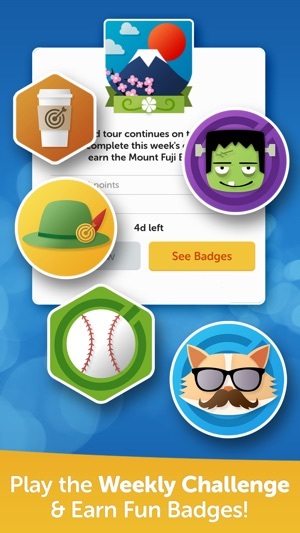 Try new rewards and boosts to help you play smarter and faster! 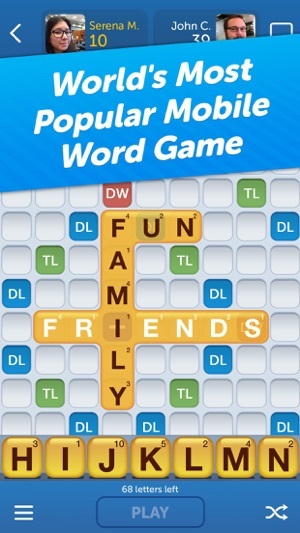 Words With Friends is the fun, free word game that lets you connect with friends and family while expanding your vocabulary and sharpening your wit. Test your brain power and spell your way to victory. 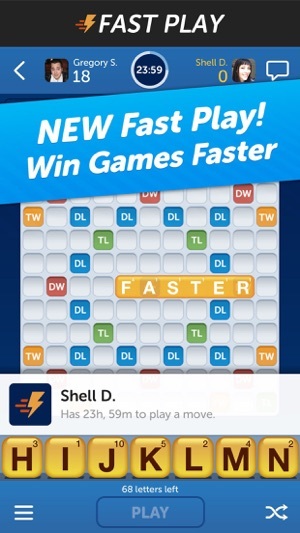 *Play Words With Friends without third party ads between moves if you previously purchased Words With Friends Pro on iOS or any other mobile device. Be sure to login with Facebook or the email account you used to make the previous purchase to continue to play without third party ads between moves. We love hearing from you! Have a question or a suggestion? We’ve updated our latest version with bug fixes and improvements! Ameliorate your vocabulary and dextrously deracinate adversaries with your incomparably declamatory submissions — or totally cheat and pretend you know what big words mean as you furiously search through a dictionary to try and find anything that beats your friend’s triple letter score. Seriously, what are we going to spell with all of these Qs? I have been playing a woman for about six months who had a screen name Of Realtor girlie. One day a man walked into my business looking to buy a house in town . Now my town I live in Fallbrook Ca. Which is a very small town in Southern California. I did not know of any realtors around however I had just finished playing a word with this realtor girlie and for some reason I used the in game text feature and asked her if she knew ANY realtors in California . She replied Yes. A little shocked , (because I could be playing Anyone in the World, ) I then said well I’m looking for a realtor that works in a very small town of Fallbrook ..... there was a long long pause, then I got a reply that she lives and works in Fallbrook . What was the chance of this happening ??? It also freaked her out as she then thought I was a stalker. I gave her my clients phone number and put them in touch and after she saw that this was for real, she met me at my flight school to thank me for the referral business. I then offered her a discovery flight to see Fallbrook from the air... and Love soon followed. She is the love of my life and we have been married 4 months now. 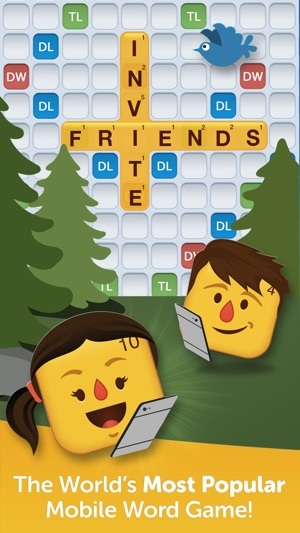 Thank you Words with Friends! The new version of the game features “power ups,” three options to give you an advantage over your opponent. “Hindsight” shows you the best move you could have played in a round, which may be available to you in the next round. “Word radar” shows you were you can play on the board for the current round. “Swap and play” enables you to swap letters without losing a turn. You can earn these advantages or buy them. Your use of these advantages is NOT transparent to your opponent. Moreover, may use these features repeatedly throughout the game. If you repeatedly use the swap and play feature, it is almost impossible for your opponent to get quality letters. You are no longer using your skills to compete against your opponent, you are using these advantages to win. The new features are enabling rampant cheating and sadly it now seems to be the norm. I can see maybe allowing use of one advantage during a game, but that should be transparent to your opponent. There is no opt-out to the new features and I simply do not want to play someone who is cheating. And why should my earned stats be given the same weight as someone who purchased a win? 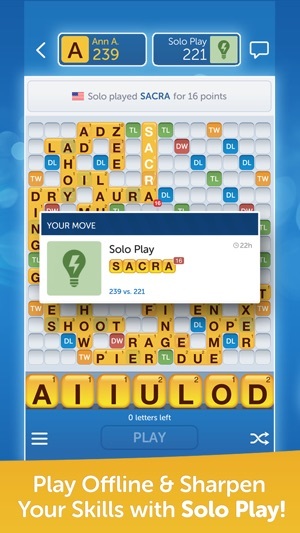 The new features of Words With Friends have driven me away from the game. 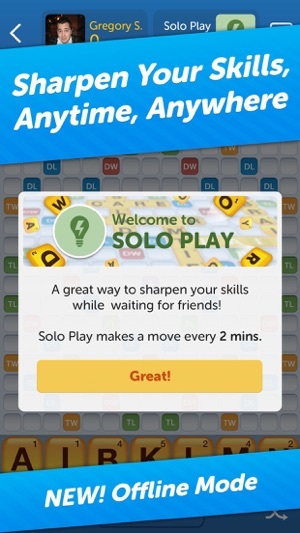 Sadly, I doubt Zynga cares about enthusiasts like me, because they are certainly making a lot more money off of the new features.